SLNS Devastanam Yadagirigutta Trust Board meeting was held on 24.06.2009 and discussed various points for develop the arrangements for devotees, they also decided to give the responsible of temple security to the Action and Technology Organization, Hyderabad. National High Way Authority of India has decided to widening the NH 202 road to arrange better transport system to Yadagirigutta. 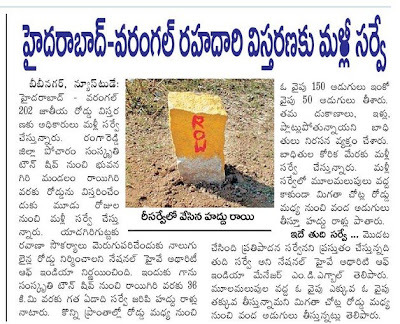 this new four line 36KM road is starting from Sanskrithi Township Pocharam Rangareddy Dist and upto Raigir, final survey has began for the same. Sri Mukesh Goud, BC Welfare Minister of the Andhra Pradesh State, India visited Yadagirigutta temple yesterday (07.06.2009) along with his family members. 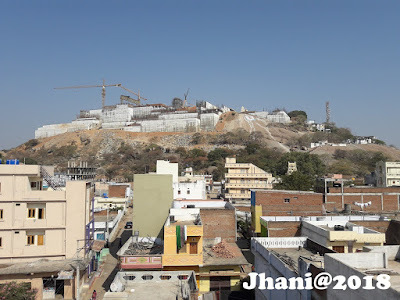 he personally observed at temple that, how the tourist are facing the problems for accomodation and other fecilities at Yadagirigutta and told to media that he will inform these all problems to the Cheif Minsiter and will develop this temple as Shirdi. he also said, they wil give the support for second Ghat road for Yadagirigutta. 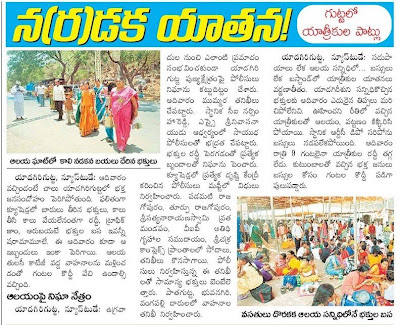 Below is the one more news about the yesterday situation at Yadagirigutta, due to the sunday (holiday) again the tourists arrivals increased in town and they faced lots of problems. vehicles were not alloweded on ghat road and diverted the traffic from the down hill Tulasi Cottege., due to this tourist went on hill by foot. 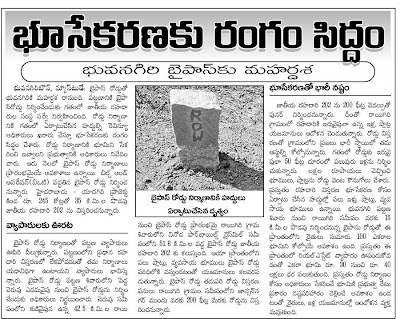 which can be seen in below news article of Eenadu.